Despite their size, Rituowl focus on small (often rodent-like) monsters. Collecting the bones of their prey, they will pluck a single, fat feather from their body and wrap the remains within it and tie it shut. They will collect these small packages in their nests, or drop them throughout the forest as they hunt. Despite this otherwise disturbing activity, young Rituowl are calm, peaceful monsters. They avoid humans and opt to flee rather than engage in skirmishes. 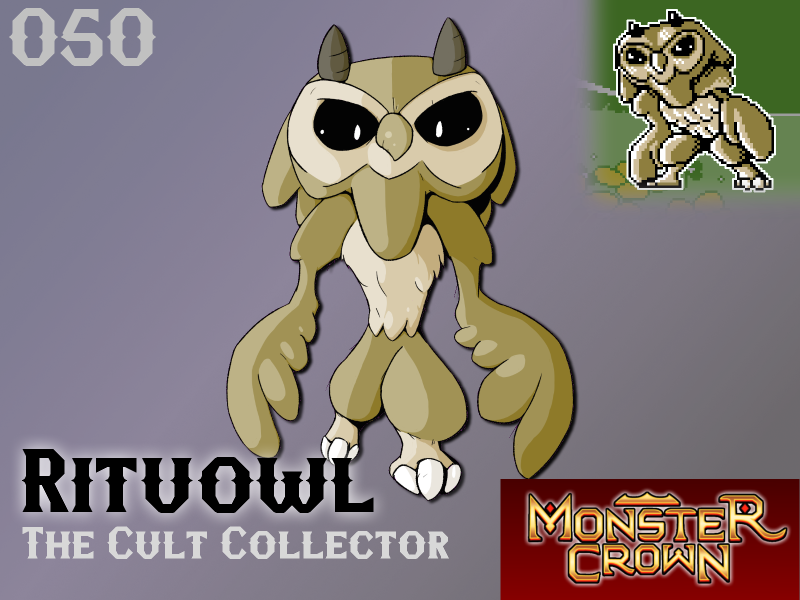 As the Rituowl age they become increasingly nocturnal and feverish in their bone collecting. After a few years the monster will begin to appear quite unwell, becoming skittish and pale. Spending most waking hours engrossed in odd rituals, Rituowl will start to develop frightening magical abilities and may even begin to lure children into the now darkened forest. At this point a king will enlist one of the island's most accomplished Tamers to enter the forest and kill the Rituowl. Luckily this service is required only once every few decades. It is unknown what threat a Rituowl would become if left unchecked. Will Rituowl make your team?